A Google subsidiary is proposing to help fund and build the Waterfront LRT as part of a futuristic neighbourhood it is developing in the Port Lands but the company wants to receive a cut of property taxes and development fees to offset the costs it incurs. Sidewalk Labs previously partnered with Waterfront Toronto on a plan to develop a 12 acre (5 hectare) parcel of land along Toronto’s eastern waterfront but the company, which is a subsidiary of Google’s parent company Alphabet, is now proposing a larger scale development for the Port Lands. 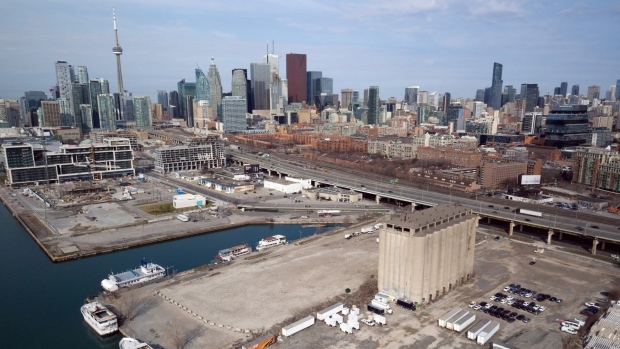 The Toronto Star is reporting that Sidewalk Labs wants to help develop 350 acres (142 hectares) in the Port Lands area, though CEO Daniel Doctoroff tells CP24 that the company would really just be “a financier of infrastructure” for the second phase of development. “The vision always contemplated at least looking at the broader geography but the way we think about it is it really should occur in a couple phases. For the first 12 acres we would actually play the role of developer perhaps in partnership with local developers where we could try out a lot of the hypothesis we have about how urban life could be improved with technology and innovation. For the second phase we would really just be a financier of infrastructure,” he said. Doctoroff said that in order to fully build out the Port Lands, the area will need mass transit, specifically in the form of the long-discussed Waterfront LRT. He said that Sidewalk Labs would be willing to help pay for that transit line in exchange for a portion of development fees and increased property tax revenue from the development. The ownership of the transit line, which carries an estimated $520 million price tag, would reside with a public entity, he said. “We are really just in the early process of formulating ideas but the notion is that if you can actually act as a catalyst to the creation of value in order to get paid back for playing that role you have to capture some of the value that is actually created and that might come in the form of a share of the increase in property taxes that otherwise wouldn’t have occurred but for the investment,” he said. “Really what we are suggesting is that our interests are completely aligned with the public sector so we don’t actually get paid back unless the public earns a lot more money,” he told CP24. Sidewalk Labs has previously promised to build 2,500 residential units as part of the 12 acres it hopes to develop, 40 per cent of which would be offered at a below-market rate. He said that in exchange, the city could create “a value-capture zone in which development charges, incremental property taxes, and increased land value stemming from the project would be used to finance” the enabling infrastructure. “Any final proposal from Sidewalk Labs will be given full public scrutiny, subject to public consultation and discussion, and, ultimately, consideration by Waterfront Toronto and city council,” he said. Sidewalk Labs was chosen in October, 2017 to prepare a plan for the development of a high-tech neighbourhood in the Port Lands. In October of this year, a number of members of the panel helping to guide the development resigned over privacy concerns, including Ontario's former privacy commissioner Ann Cavoukian. In her resignation letter, Cavoukian chided Sidewalk Labs for refusing to guarantee that other companies involved in the project would follow a privacy framework she had designed. "I imagined us creating a Smart City of Privacy, as opposed to a Smart City of Surveillance," Cavoukian wrote in the letter.